Noble’s daughter Mary Albert, in the middle of the school opening ceremony, remembers that this world was an otome game she played in her previous life, and she turns out to be a character from that game. The Mary inside the game was a villain, harassing and interfering with the heroine, and was met with destruction at the end – the so called ‘villainous girl’s downfall route’. And so the obvious reaction is ‘This isn’t a joke!’ and carefully avoids the destruction end…… or not! Involving her attendant, Addie, the deadline is one year! Will she obtain the same result as the one depicted in the game!? The translation is eye-gougingly bad. Like, bad enough that it’s hard to even evaluate whether the story itself is any good, that kind of bad. It gets even more awesome when, in the middle of volume 1, it is revealed that the MC is actually really smart and have a really valid reason for wanting her downfall. It has been mentioned on earlier chapter that the Albert House is powerful, second to the Royal Family powerful. Thus if it goes on like that, MC is afraid that the Royal Family will trash the Albert House cause they're afraid/don't want to be overthrown. Thus the MC, in her martyr-style way, decide to walk on her downfall route simply to reduce Albert House' power so that Albert House won't invoke the Royal Family's anger. This story is so mother******* hilarious, the servant is awesome and the girl is so awesome and though there is not any love development with the MC the SC has alot of love developed. The MC is trying to get to the good end of the game where she loses but her previous life influences all effect her behaviour and she does not have any of the personality the person she is in the otome game does, MC rides a bike to school because its much faster than taking... more>> a horse carriage even though the events of the game require her to take a horse carriage. She is rich girl who knows how to use money and buy the extreme necessitates she can but nothing of luxury. The synopsis does no justice to this novel. You might think "eeh the theme is so template" but even the heroine think it so. 😂 When she realized she's heading to her destruction flag, she proudly embrace that flag and even willingly harass the target..... though sadly the heroine is a boke, so all she did have the opposite effect. My reviews aren't spoiler-explicit, but as the nature of reviews tends to dictate, it isn't spoiler-free either. It's best if you skim through if you haven't caught up with the translations or don't mind glimpsing into the story. This review will be updated if needed. A fast-paced and short but sweet story of yet another villainous-noble girl. I find myself smiling throughout the chapters and smirking at the surprisingly not-annoying dense reactions of our main character. Mary, Addie, and the heroine and capturable character (s? We have yet to come across... more>> more) are all very likable, and there are far more hilarious moments than there are cringeworthy ones. Though they aren't as deep as I hoped they'd be, it's the nature of this story so I honestly can't complain. I love the story! With all of reincarnated person always keep their secret and trying to avoid the bad end, she's rushing toward bad end and failed beautifully. It's basically about a girl trying her best to become a villain but turn to a tsundere MC. A funny and sweet romance story, which have one or two particular differences with it's peers that this is not a reverse harem and the MC is immediately disclosing her past memories to someone! Instead of working alone in the dark like other MCs, she's working with her aide. The author's creating characters with lovely personalities, Mary and Addie's banter is fun to read, Alicia's naivety and unpredictability is funny and cute, and Patrick's chill way of handling things are pretty much cool. The plot is really interesting with how it's almost like a reverse bakarina story. Mary tries so hard to be a villainess it's so cute. It's very good, although I would say this isn't really a transmigration/rebirth novel. The novel starts almost directly before the original game protagonist comes to the school rather than the typical age 1. It seems Mary was quirky/levelheaded from the start and then gets hit with the knowledge that in another dimension/life, she's a video game character. Characterization-wise, Mary is quirky but loveable and her slapstick interactions with Addie, her butler, are a joy to read! She doesn't fall into "all loving saint like protagonist" territory, and her bumbling... more>> actions are hilarious. Addie is just as enjoyable, jokingly disrespecting his master while also indulging her whims. The original protagonist is quite cute and Mary's attempts at harassment fall short quite hilariously and only serve to bind the protagonist to Mary more. On the subject of love interests, that plot line ends pretty quickly as they get coupled off immediately. There's no love triangles, no other options, the pairings are pretty much set from the beginning. The only wooing that really happens is mostly Mary inadvertently seducing the protagonist into friendship. There's no political intrigue, revenge, diabolical plans, etc. It's mostly just a very fun story of Mary trying to throw herself into a destruction end but from the beginning you can tell there's no real way that would happen. Addie and Mary are pretty much together from the beginning, even though they're not official until later on. The protagonist is also coupled off with the prince character from the get go. MC: Sensible softie and a girl with strong personality! Also, she's totally ME if I ever transmigated into otome game as a rich daughter YOLO... correction: YOLT! Remember Bakarina? Not as retarded as adorable Bakarina, but Mary is better in my book because she has enough brain to make sound decisions... Or not LOL. Her antics along with her forever loyal sidekick Addie are f-- hilarious!!! Her relationships with The Heroine reminds me of the camaraderie between Reika and Wakaba! Pfft Mary! Pretty sure Bad End is sealed off forever for you, The Heroine totally In BFF Love with you~ Furthermore, if she becomes Queen in the future, I see only easy and wonderful future for you HA HA HA! 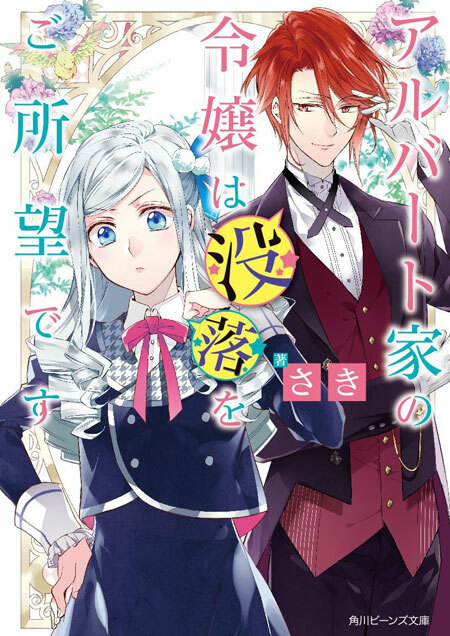 Love Interest: Addie, highly-capable handsome sidekick/butler with apparent crush for his Mary-sama. Sassy and cheeky, threatening him with Master Albert is the only way for Mary to make him bow. My question for Addie: "What the hell is actually hidden under your furnitures?!! P*beep*N?! Adult mags?? Mary's photobooks?!" Heroine & Patrick: "May Your Love Be Blessed Until Death And Beyond~"
Mary is absolutely adorable in the way she tries to become a villainess girl but comes off as helpful instead. I feel that Addie may the only one for her and her cuteness! I started reading novel not so long and I can’t judge how good this story is, but I’m sure it will give you a good laugh if you give it a try. Just done reading all of mushroomprincess updates. All I can say is that, every chapter is short yet you looked forward for the next chapter due to the plot being cute, funny and moi 😍👍. Pity that it was being stopped (translation) but thankfully a new translators pick this up (Asian Hobbyist). Well, I just hope they'll have a regular released for this. Basically this story is about a person in another world who gets hit with a memory that she is the villain and the world is a game. Two chapters in I have no idea why she decides to play her part, seems to be "Because I can"- of course, the strange translation (which initially seems competent with the translator translating difficult words well) and poor editing (strange archaic and unused word choices, combined with seemingly random letters and the incorrect words dotted here and tehre) make it difficult to be... more>> aware of what's going on all the time. There is no description of the surrounding environment, uniforms, the descriptions of the characters is very vague. There's not much to say currently as it feels like an intro so far to me. Well, first off, this focuses more on comedy and is similar to a parody. The comedy gives it justice and is quite funny. The MC and the servant plays the wonderful role of question and reply that gives hilarious reactions and jokes happen. The novel spins on originality and I find that quite commendable. Firstly, the MC actually shares her "secret" with someone and she takes on a decisive and carefree attitude into doing what... more>> she decided. The protag is also hilarious and crushes my impressions of supposed-to-be protag. The supposed-to-be male lead is a cliche but likable and ACTUALLY charismatic like he is described. The pace was a little slow as it just focuses on comedy and background on the characters. The MC is eccentric, strong, intelligent, and a little dense. The servant is straightforward, friendly, considerate, and a little sadistic. The protag is cute, child like, saint like, and a little naive. The supposed-to-be male lead is charismatic, intelligent, confident, and a little tsundere. The MC comes from a powerful family and has a close relationship with servant as if they are friends and is engaged to the supposed-to-be male lead and recently turned best friends with protag. It can be summarized as such. But this story shows a little more depth later on. For example, regarding her decisions in acting as a villainess and her decision regarding her engagement. There is also a heartfelt conversation between MC and servant about her feelings and love. This scene gives a whole new vibe from the usual although it reverts back to the usual some times later. Yes it is official. Addie is in love with her but he hesitates to tell her so because he probably doubt if she has feelings for him which sadly she probably haven't developed anything too deep and also because of their difference in status that he is so aware of. His speech about his implied feelings was really a shock and very impactful. It was one of my favorite scenes. The MC probably also realizes but I'm not too sure, she could be dense and thinks he's directing it for someone else. But you can see their relationship change slightly after that ordeal. To me, they're my official ship. Not really my cup of tea. The MC just lacks self awareness and too lacking in common sense. Its not really funny for me 😣. Even thou the MC has reasons for chasing after her downfall route. But dont be discourage in the low rating. Cauz, this might be just your cup of tea 😊. Giving 3* for translator's good job in translating. Keep-it up yo 😁. Cute. Really cute. Though she has a legit and serious reason to aim for ruin, her tries at being villainous come off as being Tsundere and the interactions with her servant Addie is funny. To be honest, this is one of the few stories I consider a diamond. This is the type of story where you came in with all comedy and light hearted stuff before you get hit with feels and plot. The only reason I would discourage anyone from reading this is if they do not like a slow burn or would like a drama-filled novel. This is not a drama novel, but that does not make it any less interesting. Actually, because the drama (if there even is any) does not overshadow the characters and the plot, it is easier to empathize with the characters and actually feel what they feel; thus, making it more interesting. Another discouraging factor would be the translation. There are a few faults in grammar, but the biggest inconvenience would be the archaic words. So either being eloquent or having a dictionary at hand is recommended. Other than that, the plot and the characters get a 10 out of 10 from me. I will repeat this for fellow readers.